Flex-Mold Non Skid Repair Patterns are designed to transform a difficult repair into an easy job for the do-it-yourself enthusiast. Flex-Mold patterns are available in several styles so that you can match an existing non-skid deck surface. Most molded non-skid repairs can be accomplished with a straightforward gelcoat patch. Sold in 12" x 12" squares (1 sq. ft). I have a 2008 Bluewater 2550. Any idea which pattern I need to order? The guide shows either #316 or 404 square patterns. Measure how many squares in an inch and choose the right one. Please call one of our sales associates at (800) 497-0010 for any FlexMold patterns that you do not see on our site. I have an 65' Outer Reef Motoryacht, 2007 that I am repairing some of the non-skid. It is a diamond pattern, can you tell me which one is the correct pattern for this boat. Flex Mold does not indicate in any of their literature if or which style was used for Outer Reef Yachts. Outer Reef is still producing yachts, we recommend inquiring directly to them, as they may have used a different patter manufacturer. It can be very tough to pick which texture it is otherwise, even my photos or description. We do ship internationally, yes. When searching for Boston Whalers, there are 2 patterns that come up, #327 and #332. At the same time it may not be either of these, but you can also reach out to Whaler with regards to this, they are pretty good about this sort of thing. Can you tell me which pattern is used on a Catalina 42 mkii sailboat (1996).I live in Italy. Could you send the Flex-mold in Italy? 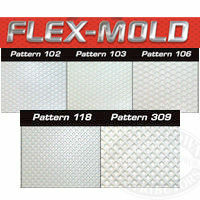 Flex-Mold patterns 301, 306, 317, and 327 can be found on Catalina yachts. you would have to figure out which one you have. Or you can reach directly out to Catalina Yachts, they are great at customer support. Can you tell me which pattern is used on a Schock Harbor 25 sailboat. It appears as though the designer/builder of the boat are still in business. Try to contact them directly and inquire which one they used, or if they used a custom one. Otherwise it's not clear which pattern they used by searching the Flexmold info we have. I have a 1981 MacGregor 21. Is there a flex-mold non skid pattern for my boat? If you go to the Flex-Mold site and search MacGregor, their part number 301 GFP comes up. Take a look and see if that matches your non-skid. Jamertown Distributors helped me find the exact mold for my deck non slip.Thank you for the support. Are these made out of gold?